Introducing the latest development from FLIR - the global leader in thermal imaging. The all new FLIR B40 is a truly revolutionary infrared camera at a price you can afford! Now even smaller businesses with tighter budgets can take advantage of the many benefits an infrared camera can have on their bottom lines. 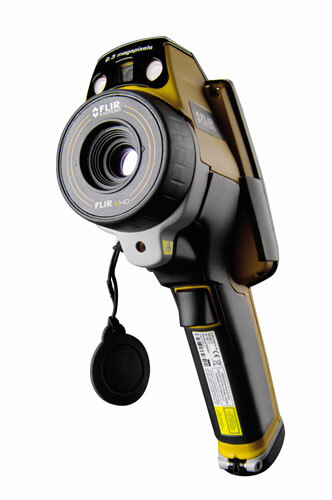 The FLIR B40 Infrared Camera will allow you to perform more thorough inspections in less time and with less effort. The FLIR B40 Infrared Camera features picture-in-picture (PIP) that allows you to overlay the infrared image directly onto the corresponding visual image so you can see an infrared image super-imposed in a visible light image. With the instrument's high accuracy of 2% and thermal sensitivity of better than 0.1ºC, you'll have the ability to uncover potential problems faster and easier than ever before. The thumbnail image gallery allows you to recall images to help you build expert reports. The built-in illuminator LED lights give you the ability to work confidently in dark and confined areas. Boasting a temperature range of between -20ºC to +120ºC, the FLIR B40 Infrared Camera has hot and cold color, dewpoint and insulation alarms. The FLIR i40 has a visual camera with 0.6 Mp resolution. FLIR B40 weighs only 600g and is easy to store in a belt pouch. Clearly see temperature readings on the Flir b40's large LCD display.